This limited gift set retail for $40, I had to get this one look as all the duochrome shades! This set contains to duo tone/duochrome shades that had ,e stunned. 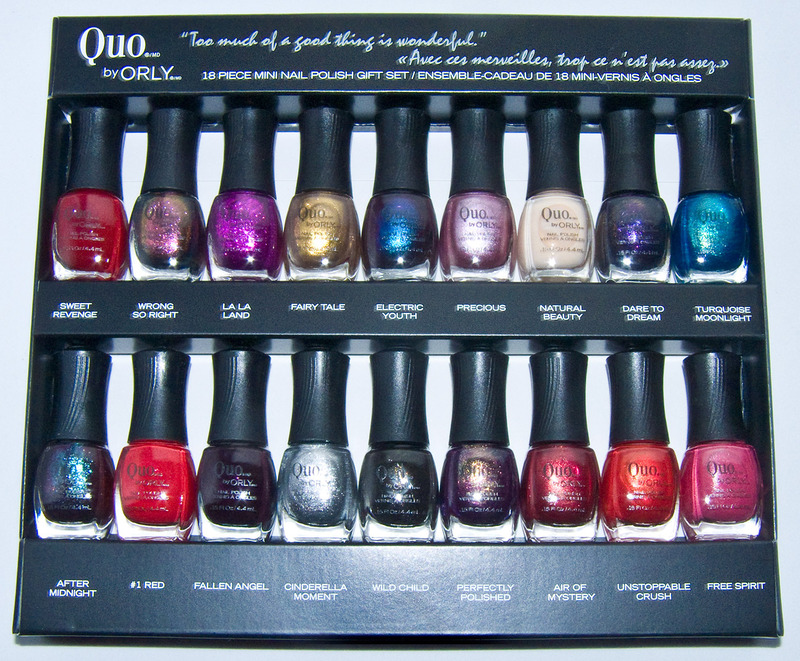 There are also 6 piece sets for $20 with holiday shades and glitters. I won't be swatching these again because my nail always get damaged with the work I do and They no ling enough. But I do have a list of dupes. The Quo by ORLY line retails for $10 a bottle and is on pare with Nicole by OPI ($9.99) and Essie ($12). Electric Youth, and Wrong so Right. Unstoppable Crush, Air of Mystery, Perfectly Polished, After Midnight, Turquoise Moonlight, Dare to Dream, Electric Youth, and Wrong so Right. 2 Sheer in Sweet Revenge (semi sheer red) and Natural Beauty. Wrong so Right is very close to ORLY's Space Cadet from 2 years ago. Also MAC's Mean & Green. After Midnight is a dead wringer for ORLY's Galaxy Girl from 2 years ago. Also MAC's Formidable. Turquoise Moonlight is every similar to ColorBlast by ORLY Brilliant Sky which just larger gold shimmer in it. It also reminds me of ORLY's Haley’s Comet from 2 years ago. Unstoppable Crush is a dupe for MAC Styleseeker Nail Lacquer. Perfectly Polished is excitedly for me a dupe of Zoya Daul Nail Lacquer because it really impossible to get Zoya in Canada. Zoya Daul has smaller shimmer particles then Perfectly Polished however. Now most of these duo chrome polishes will need 3 coat as they made a little bit sheer so the shimmer/reflex glitter is apparent rather then buried.